– A voracious insect – the bronze birch borer – is picking off beloved birch trees throughout Oregon. Common for many years in Eastern Oregon, the hard-to-control beetle first showed up west of the Cascades in 2003 in Portland, where it has killed hundreds of trees. It slowly migrated and is now found in abundance as far south as Klamath Falls, according to Nicole Sanchez, a horticulturist with Oregon State University Extension Service. 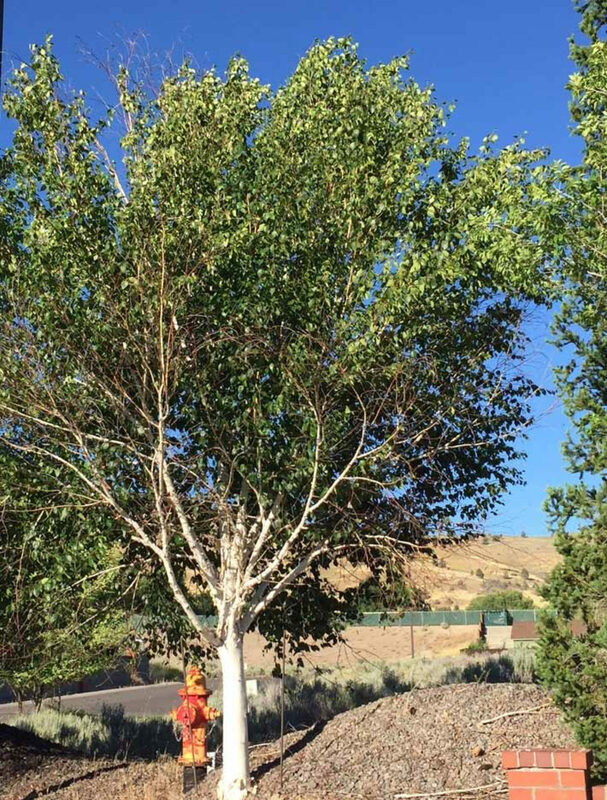 Sanchez has co-authored a detailed fact sheet on the problem called Homeowner Guide to Managing Bronze Birch Borer in the Upper Klamath Basin. The information is relevant for the entire state. The first sign of infestation is flagging branches with sparse, stunted and yellowing leaves at the tree canopy, she said. Twigs will fall and eventually the branches lose their leaves. Ultimately – often before a homeowner notices – the tree will have so much damage it’s impossible to save. Caught in early stages, death can be averted. There’s no easy way to defend against the pest. Besides cultural practices like mulching and watering, which can help fend off the insect if the tree isn’t yet infested or early in the infestation, the only solution for control is chemicals. Sanchez, who has seen trees killed by inappropriate applications of pesticide, cautions homeowners to use them correctly. The pesticides – which are usually used as a drench – should be applied at the tree’s drip line (where the branches reach) – not next to the trunk. If possible, hire a certified arborist. Birch are wind pollinated, but the catkins may be attractive to bees so insecticides should only be applied after flowering has occurred in spring to reduce possible exposure. Don’t apply systemic insecticides, which are the most commonly used, when flowers that are attractive to bees are blooming nearby. Remember you must follow the instructions on the label. It’s the law. The adult bronze birch borer looks like a tiny long football and is olive to brown with coppery metallic wings and body. It lays eggs under loose pieces of bark at the top of the tree. After about two weeks, the eggs hatch and the larvae bore into the cambium layer where water and nutrients move around. As it feeds, the frass it produces plugs up pathways. It feeds for two years, during which it does considerable damage, and then emerges. By the time you see the D-shaped holes, damage can be significant. “Because the insect larvae feed at the top of the tree, damage sometimes is not obvious right away,” Sanchez said. Bronze birch borer, a North American native, has plagued the eastern United State for decades. It is attracted to the most common and popular birches with white bark such as the European white birch (Betula pendula), white-barked Himalayan birch (Betula utilis var. jacquemontii) and European white weeping birch (Betula pendula ‘Youngii’). The best bet are native river birch (Betula nigra), beautiful trees with flaking bark in variable colors from tan to light brown, that have proven to be resistant to the insect. Other resistant trees are the hybrids ‘Heritage’ river birch (Betula nigra ‘Heritage’) and ‘Whitespire Senior’ gray birch (Betula populifolia ‘Whitespire Senior,’ which tends toward white. Stressed trees are a magnet for bronze birch borers, so keep them healthy. Birch like moisture and a cool atmosphere for its shallow roots so watering and mulch are essential. Water regularly and deeply (about 10 inches). Some shade is not a bad idea, either. Birch naturally live at the edge of forests, not in the ground between sidewalk and street. In Sanchez’ publication you’ll find a chart showing the advance of the damage, ranging from a healthy tree to one that needs to be removed.